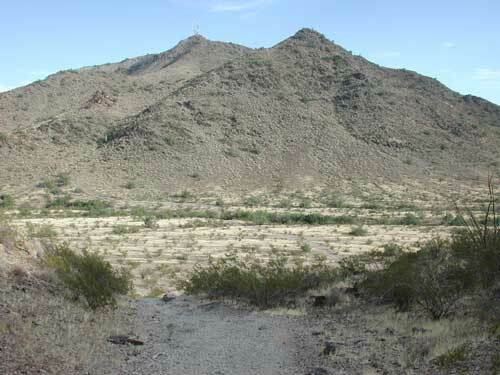 North Mountain, one of the larger units of the Phoenix Mountains Preserve, is bounded on the north by Thunderbird Rd., on the east by 7th Street, on the south by Peoria, and on the west by 19th Ave. North Mountain (elev. 641 m, photo at right) is on the east and Shaw Butte (655 m) above) is located to the northwest. Both summits are crowded with radio towers. 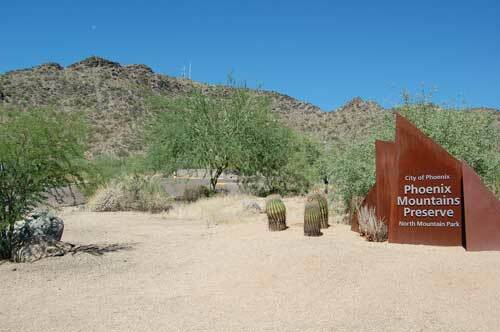 The North Mountain Recreation Area, with access just north of Peoria Avenue off of 7th Street, has plenty of picnic ramadas and a trail that is very popular, especially for people seeking a good workout hike. This trail is much easier and also less heavily visited than either Camelback Mountain or Squaw Peak. About 2/3 of the trail follows a black-topped road to the towers at the summit. Parking is rarely a problem even on a pleasant Sunday in spring time! Alternately, access to this area can be made from the south via Mountain View Park about 2 miles north of Dunlap on 7th Avenue. Yet another trailhead is provided on 7th Street just south of Thunderbird. The Geology is varied. North Mountain itself is composed mostly of ancient metamorphic rock dating to the Pre-Cambrian Period. Gneiss (alternating light and dark bands) and schist (highly compressed and layered) predominate. Shaw Butte is similar, but has a bilayered cap of much younger Quaternary or Tertiary volcanic ash and basaltic lava. The huge time gap between the layers as well as the isolation of the lava flow give stark testimony to the power of erosion operating over hundreds of millions of years. North of Mountain View Park there is a large earthen dam that protects nearby homes by lowering the risk of flooding. A thick layer of fine soil has collected behind that traps a lot of moisture; plants with deep root systems such as mesquite and blue palo verde grow there. There are salt bush, desert lavender, gray thorn, mesquites and blue palo verdes growing behind the dam. Trail from North Seventh Street entrance: A large parking area and trailhead is provided on Seventh Street south of Thunderbird for access to trail No. 100. The trail passes beneath Seventh Street (underpass) from the preserve unit to the east. After a brief westward route, the trail then turns south through the valley that separates North Mountain from Shaw Butte. Within sight of the parking area is a small water catchment constructed with Heritage Fund support for the purpose of "habitat improvement." There are a few small Fremont cottonwoods and a sparse planting of mesquite. A barrier fence and sign ask hikers to keep out or the revegetated area. The cottonwoods turn bright yellow by late fall. About a half kilometer on trail No. 100 brings you to Trail No. 106. Turning west on this spur will bring you to an earthen dam that helps protect the housing development at Central Avenue. There are a lot of Blue Palo Verde growing on the dam and behind it. Many people prefer the flat land hiking, however, if one chooses there are connections that can be taken to ascend either summit. The west slope of North Mountain is sparsely vegetated; the dark green shrubs at center are Creosote Bush -- Larrea tridentata. Area map adapted from Phoenix Parks & Rec. Map. Easiest access points are from 7th Ave or 7th Street north of Dunlap. Or 7th Street South of Thunderbird. 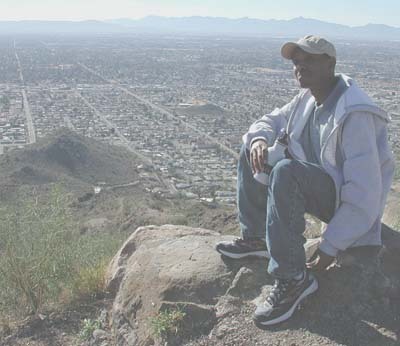 Adam, a college student from Kenya, takes in the view of Phoenix from the top of Shaw Butte. South Mountain and the Estrella Mountains are visible in the distance. Promising winter rains in November and December have been followed by sunny, dry and warm weather. Many small annuals have grown up, but are very small. Should a good soaking rain come in the next couple of weeks they will grow rapidly into larger, flowering plants. Today I found three shrubs in bloom: Desert Lavender, Sweet Bush, and Wolfberry. Minute blooms were also open on comb-bur and popcorn flower. At the summit I was surprised to see Pima Orangetip (Anthocharis cethura pima) butterflies and a Canyon Wren was a new bird for me at this location. Two weeks of unseasonably early triple-digit temperatures were followed by out-of-season, monsoon-like thunderstorms this past week. By 7 PM the temperature was about 32°C, warm, but not too hot for a hike. I hiked up Shaw Butte from the Central Ave. & Thunderbird trailhead. Three or four Lesser Nighthawks were already on the wing in the setting sun. It's possible they are nesting atop Shaw Butte upon expanses of the barren, basaltic lava. Not a bloom open except for the last of the ironwoods near the trail head. Creosote Bush are loaded with glistening white seeds. At dusk I heard and saw a singing Bendire's Thrasher, a new record for me at this location, also near the lava fields. Some hikers ahead of me spotted a Tiger Rattlesnake, but it moved on before I had a chance to see it. Black-throated Sparrows and Rock Wrens put in their own songs as the sun sank below the horizon. A week ago this area was soaked well with the first decent summer rains of the year. Temperatures soon rebounded to over 40°C and so delicate annuals simply have no time to get established before the top soil layers are again bone dry. Shrubs and succulents on the other hand have taken full advantage and have greened up. Today was mostly cloudy with a good chance of more showers. None fell but the milder conditions prompted Graham's Pincushion to bloom with radiance! Another treat for my morning hike was a Roadrunner sitting atop a knoll surveying the desert all around. On my approach it leapt up catching the breeze and glided way down to the valley below and scurried into the brush. I discovered today why so many Cactus Wrens and Rock Wrens gather near the summit! Bright lights for security illuminate the communications tower and equipment. This draws in moths and other insects: at daybreak the wrens pick the resting insects from fences, walls and rocky surfaces. Trail from North Mountain Recreation Area to Summit. In the first canyon from the trailhead a hunting coyote caught the attention of a Rock Squirrel which kept up a continuous, very loud barking. Basically it was telling the coyote it had been seen and should not bother trying to stalk. Birds and other squirrels heard the alarm as well and kept a wary eye. Trail from North Mountain Recreation Area to Summit. Barely up the trail from the parking area there is a lone saguaro cactus that has suffered repeated pummeling with rocks. It is badly scarred with blackened injuries any of which could have resulted in a fatal systemic infection. At the very least the plant has suffered a reduction in photosynthetic ability and has been transformed into an unsightly giant. Maybe the parks department should set up a remotely activated camera to snap a picture of culprits! UPDATE: In Sept. of 2003 as I was hiking up this trail I caught the very distinctive scent of a saguaro in death - yeasts and bacteria breaking down the flesh. The pummeled cactus had fallen and the richness of this desert preserve dropped accordingly. Rock Wren -- Salpinctes obsoletus -- -- Very common little birds which frequently give spirited high pitched trills while perched atop prominents. Their drab gray and brown color blends perfectly with the desert colors. Black-throated Sparrow -- Amphispiza bilineata -- Lovely birds with a jet-black throat and bib contrasted by bright white eye brows. Beautiful singers. A very nice description of the black-throated sparrow can be found at Twentynine Palms Cyberzine (California). Verdin -- Auriparus flaviceps -- Tiny birds, barely larger than a hummingbird. Drab gray brown with a majestic yellow head. Anna's Hummingbird -- Calypte anna -- Common. Green back; forehead and throat of males magenta. Black-tailed Gnatcatcher -- Polioptila melanura -- Fairly common in the bigger washes where the trees grow a bit larger. White-crowned Sparrow -- Zonotrichia leucophrys -- Fairly common especially in winter. Abert's Towhee -- large brown sparrow. Several make their homes in the brush growing back of the earthen dam above Mountain View Park. Gila Woodpecker -- Melanerpes uropygialis -- Common woodpecker that builds nest holes in the Saguaro Cactus. Common Raven -- Corvus corax -- Conspicuous, fairly large, jet black birds that soar above looking for food. Gilded Flicker -- A much larger woodpecker than the Gila. Cactus Wren -- Campylorhynchus brunneicapillus -- These birds require more food than would normally be available in this sparse habitat, and so are generally restricted to areas near the picnic tables where they find supplemental food in the form of crumbs and handouts. Photo at right. Northern Mockingbird -- Mimus polyglottos -- more at home near homes and lawns but does forage in the desert also. Phainopepla -- Phainopepla nitens -- looks like a black cardinal. prominent crest and a red eye. Ladder-backed Woodpecker -- a small black and white woodpecker with a red nape. Greater Roadrunner -- Geococcyx californianus -- There is one that frequents the parking area at North Mountain Recreation area. Sharp-shinned Hawk -- One seen cruising along ridge February 2000. Probably feeding on birds drawn to neighborhood yards and their handouts of seed. Canyon Wren -- One seen and heard on slopes near summit. Verdin -- Tiny birds, barely larger than a hummingbird. Drab gray brown with a majestic yellow head. 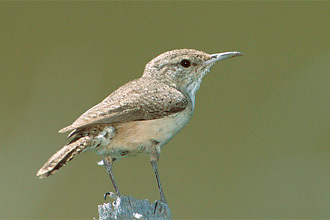 Rock Wren -- Very common little birds which frequently give spirited high pitched trills while perched atop prominents. Their drab gray and brown color blends perfectly with the desert colors. Anna's Hummingbird -- Common. The forehead and throat of males is magenta. Both males and females have bright green backs. 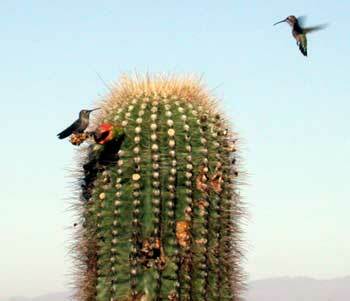 In July 2005 I watched up to three birds quarreling over a single saguaro fruit. White-winged Dove -- these birds focus their attention on the fruiting saguaros. Black-tailed Gnatcatcher -- Fairly common in the bigger washes where the trees grow a bit larger. Black-throated Sparrow -- Lovely birds with a jet-black throat and bib contrasted by bright white eye brows. Most of the Black-throated Sparrows have gone north, but the ones that remain are actively singing and breeding through summer months. Great Horned Owl -- a nesting pair holds claim to North Mnt. territory. Gila Woodpecker -- Common woodpecker that builds nest holes in the Saguaro Cactus. Gambel's Quail -- a favorite of many people and so are heavily subsidized with bird seed in nearby home yards. Ash-throated Flycatcher -- most common in the springtime, March thru June. Mourning Dove -- fond of gathering crumbs left by picnickers. Brown-crested Flycatcher -- Myiarchus tyrannulus -- similar to Ash-throated Flycatcher but with a heavier bill. Lesser Nighthawk -- near the Heritage Fund water catchment area (see above). Cactus Wren -- a sizeable gathering of cactus wrens visits the summit area each dawn to gather moths that came to lights at night. Roadrunner -- There is one the frequents the parking area at North Mountain Recreation area. Side-blotch ed Lizard (Uta stansburiana) -- most active lizard during cooler parts of year. 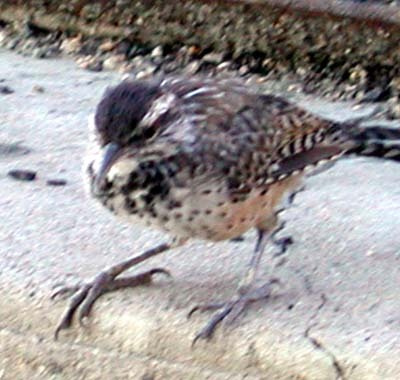 Dark patch behind forelegs; bluish throat. Chuckwalla (Sauromalus obesus) -- much more common in the recent past than now. On May 14 I spotted one along the paved road to the summit of North Mountain. 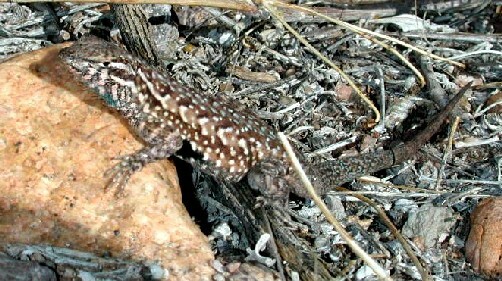 Western Whiptail -- Cnemidophorus tigris -- banded and spotted lizard digs holes beneath creosote. Tiger Rattlesnake (Crotalus tigris) -- pale buff specimen with darker crossbands seen in wash near 7th Street. smallish head. Ground Snake (Sonora biannulata) -- pale brown specimen only 10 cm long, a juvenile, found on road to North Mountain summit. These snakes mostly eat insects and arachnids. 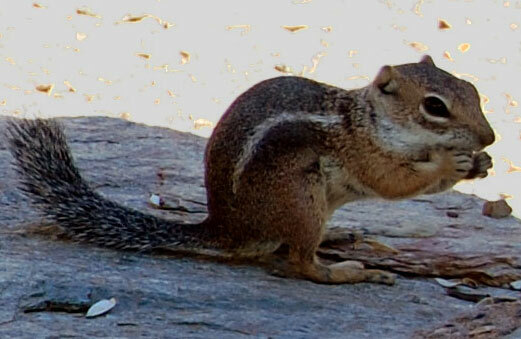 Harris' Antelope Squirrel (Ammospermophilus harrisii) - small squirrel with a long bushy tail. White stripe along flank. Very common around people areas. Round- tailed Ground Squirrel (Spermophilus tereticaudus) - small squirrels that burrow incessantly and are often mistaken for gophers or prairie dogs. Western Pipistrelle Bat (Pipistrellus hesperus) - At dawn these bats can be seen re-entering their daytime roosts within crevices in north-facing cliffs. Black-tailed Jackrabbit (Lepus californicus) -- huge rabbit with huge black-tipped ears. Gray Fox (Urocyon cinereoargenteus ) -- On July 15, 2005 I spotted this predator hunting near the summit of North Mountain. It was probably catching the moths and other insects that come to the bright security lights that illuminate the radio tower installations. Ringtail (Bassariscus astutus) -- normally nocturnal but in times of drought/food shortages may be diurnal. Compass Barrel;California Barrel -- Ferocactus cylindraceus -- Spines tinged with red and yellow. Buckhorn Cholla -- Cylindropuntia acanthocarpa -- Most of the chollas are of this species. Saguaro Cactus -- Carnegiea gigantea -- Distinguish small individuals by their gray spines. The best stands are on the west side of Shaw Butte. Many have been repeatedly vandalized by rock-throwers. 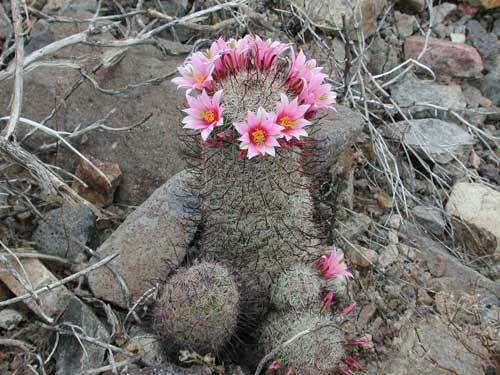 Graham's Pincushion Cactus -- Mammillaria grahamii -- Fairly common on the flanks of Shaw Butte. Teddy Bear Cholla;Jumping Cholla -- Cylindropuntia bigelovii -- just a few located on the southeast facing slopes near the summits. The joints frequently fall off and begin rooting and may grow into new plants. 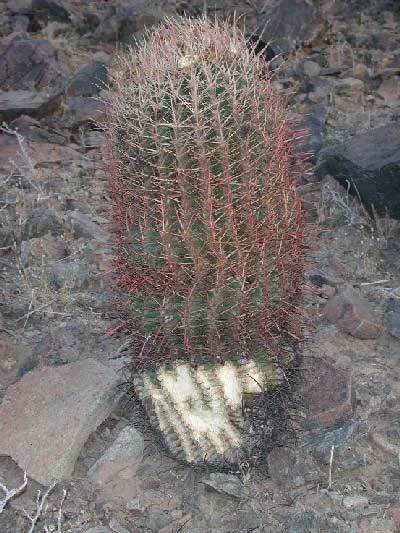 (Ferrocactus acanthodes). This cacus' defenses have been breached by Audubon's Cottontail and will probably succumb to continued feeding by hungry rabbits and woodrats. Photo by © Mike Plagens. Triangle-leaf Bursage -- Ambrosia deltoidea -- The most common plant in this desert preserve. Often leafless after periods of drought or hard frost. Foothills Palo Verde; Yellow Palo Verde -- Parkinsonia microphylla - This is the only tree found growing upon North Mountain, and then most specimens are only shrub-size. Anderson Thornbush;Wolfberry -- Lycium andersonii - a few here and there. 1 to 2 meter tall shrub with noticeably dark twigs. 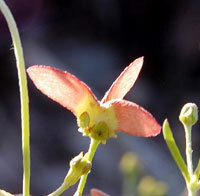 Sweet Bush -- Bebbia juncea - Fairly common at the road sides and behind earthen dams. Desert Broom (Baccharis sarothroides) - A single large shrub just above where the dirt trail joins the paved road. Some more are among the picnic areas below. Large examples at the North 7th Street trailhead. Mesquite (Prosopis velutina) - A few very small saplings less than a half meter tall adjacent to the paved roadway. Also grow on or behind flood control dams. Desert Lavender (Hyptis emoryi) - a few can be seen near the summits below the towers and behind the earthen dam. Janusia Vine -- Janusia gracilis - a twisty, viney plant also near the top. Mormon Tea (Ephedra aspera) - Only a single shrub is easily visible from the road up North Mountain, about a third of the way up the trail. There are others on up Shaw Butte. Desert Mistletoe (Phoradendron californicum) -- parasitic, grows in the crowns of palo verdes and ironwoods. Blue Palo Verde -- Parkinsonia florida - Found growing on and behind the earthen dams built for flood control. Also a few near restrooms taking advantage of water from leach fields. Tamarisk;Salt Cedar -- Tamarix pentandra -- Also called "Salt-cedar". Grows around flood control dams. Fremont Cottonwood -- Populus fremontii -- several trees have been planted by game and fish near North 7th Street trailhead. White-thorn Acacia -- Acacia constricta -- one growing from sheer cliff in 7th Street road cut. Gooding's Willow -- Salix goodingii -- along 7th Street near resort. The fruits of Janusia Vine appear like small maple seeds. Three seeds each with a papery wing are joined at base. North Mountain is a part of the Phoenix Mountains Preserve. Brief rain in January was followed by more than a month of rain-free days. Now the first week of March follows a week of heavy rains. Those seedlings that survived since the January period are now blooming, but mostly on small plants. More will soon germinate, but the higher temperatures of spring will arrive soon. The wildflowers that germinate now will grow and flower quickly, and so will also be smaller than usual. But there will be plenty of flowers to find and enjoy! The chart below records the blooming months for wildflowers and flowering shrubs at North Mountain and Shaw Butte. Month Name Only : no flowers. no live plants.